You can run your business, from your phone, for less than your phone costs you a month... What are you waiting for? One of the greatest modern day conveniences, is the ability to access nearly anything right on our mobile devices. Your music, family and even your bank account are all things you can access from your phone. The speed at which society has adapted to this is unlike anything in modern times. However, like true creatures of habit, our resistance to change still shines through. In the modern age, where the device in your pocket is more capable than a computer from ten years ago… businesses are still failing to adapt at alarming rates. Most businesses have the capability to manage their process from that device we all carry in our pockets, our dearly coveted mobile phone. When we set out to build CAR, the number one goal we wanted to achieve was complete mobility. That means, if you are across the planet and your employee calls you about an invoice he needs you to review… you not only can, you do without hesitation. 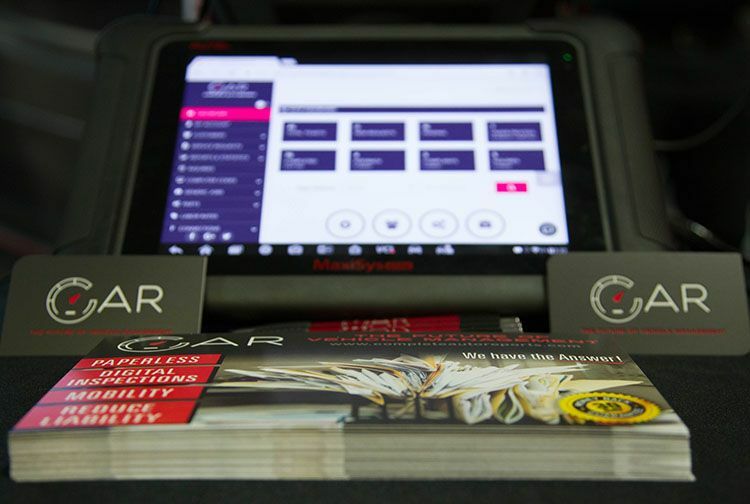 Our auto repair software gives you the power to keep track of what is going on in your shop from that ~5 inch screen you carry with you to every corner of the globe, easily transitioning to a tablet or desktop without skipping a beat. We also realized that an important step in fixing today’s vehicles was managing diagnostic data. So we made sure we could access CAR from your Autel Scan tool. Here you can save the PDF files right into the service request, providing the tools that boost efficiency in your business. You can also utilize your scan tool, or anything with a camera and web browser, to save photos or videos of problem areas into a service request as well. Our shop management software offers you the complete mobile solution to manage customers, employees, and vehicles from the palm of your hand. Our process is unlike any other available today and is designed to plug right into your business. Our mobility does not stop with you at the auto repair business, we extend it to give your customers the opportunity to mobilize their auto repair experience as well. Customers have the ability to make appointments without calling, view your estimate, view the digital vehicle inspection report, and accept or reject your recommended services right from their mobile app. We give you the tools to WOW your customer, without you having to do any extra work. We just want you to do your job to the best of your ability, which is the same thing your customers want from you.